Late Starters' Journey to Financial Freedom | Personal finance topics including budgeting, saving, shopping, housing, investment and career advancement. 401K and IRA for foreigners in the United States? How much income paid for rent? My family’s story in Chinese stock market. What is the gas mileage of your car? We have been busy with other things in life since more than a year ago and just responded to questions/comments sparingly. I (Yannick) didn’t expect to do another post for a long time but obviously changed my mind because of the excellent question from Abhishek: are there any strings attached to these retirement accounts for foreigners? If a foreigner plans to stay in US until retirement, then the answer is a straight-forward “no extra string”. For tax purpose, Abhishek has been in the States long enough (6 years) to be treated as a Resident Alien, same as a US citizen. So same rules and penalty apply regarding distribution and early withdraw. How does the foreigner’s home country treat retirement accounts in US? Is the investiment in a US 401K or Traditional IRA treated as tax deferred as well? Is the Roth IRA treated as tax-free? If not, there’s little reason to use them except contributing to the minimum level in a 401K to get employer match. If the answers for above questions are yes, then you can have the option to leave the money grow tax-defered or tax-free in US until you reach retirement. US still has the most efficient captial market and lots of long term potenial. So this could be a good diversification investment strategy. Be sure to choose an institution/custodian which keep accounts open when you leave the country. I also recommend to roll-over 401K balances into an IRA accont before you leave. What if I need to leave US and also need the money before retirement? First, you want to file a W8BEN with your US custodian to avoid a automated 20% tax withholding at the time of withdraw. To avoid 10% early withdraw penalty, you need to see if a tax treaty allows a trustee-to-trustee transfer of your money from a US account to a pension fund in your home country. If not, you want to see if you are okay with annuitizing your traditional IRA money (roll-over 401K to traditional IRA first) or just withdraw your Roth contributions. A SmartMoney article summarized this approach very well. This applies to all US residents. In summary, if you don’t know your long term plan yet, you are likely better off by contributing to 401K and Roth IRA as long as your home country doesn’t double tax you for income earned in US. Please check out our ranked list for savings to manage the trade-off between tax-advantage and liquidity. BEST OF LUCK to Abhishek and all you visitors! Intrigued by an MSNBC’s article titled Americans becoming increasingly house poor, Golbguru recently write an post inquiring people’s expense on housing. The MSNBC article only revealed that an average homeowner spends nearly 21% of their household income on housing, up from under 19% in 1999. Percentage-wise, Californian spend the most, 25.4% in 2005. The data includes many homeowners who bought their houses before the boom, thus, the 2 to 3% increase does not seem very dramatic. For more recent buyers, I do not know any friends who spend less than 25% (one couple bought earlier with 200K annual income) of their income on housing, most between 30 to 40%! However, I did not find any percentage for renters. My further research found that the ratio really depends on the locality. In Golbguru’s case, he was able to pay only 11% of his gross household income (mainly two graduate students’ stipends) on rent, likely around $500 in a University subsidized apartment. Yes, an excellent job of Golbguru! New York City is likely the other extreme, high rent and low vacancy. People not only need to get in line to rent an apartment, but also need to hire a professional broker for apartment hunt. According to New York City’s Economic Snapshot July 2006, the average monthly contractor and increased by 25% after adjusting for inflation, from $767 in 1991 to $956 in 2005. From the following picture, we can see average rent as % of average renter’s household income has also swelled from 34.4% in 1991 to 36.7% in 2005. It seems that not only the housing price soared, the rent was raised significantly too! I hope no one pay so much to stay in NYC. Of course, if you’re earning more than average renter’s household income and live under your means, you can beat those ratios. I attended graduate school on the west coast, where rents are high. University housings are both cheaper and more convenient compared to local rental market. I was earning 23K annual stipend, but paid about 28% of my gross income for one room in a 2-bedroom university dorm. Despite the small annual raise of 1-3% of my stipends, when I finally graduated, I was paying 39% of my gross for the same room. A very good strategy to move out PhD students faster! Right now, with 2 full-time job income, Jacqui and I are paying about 7% gross including cell phones and utilities, not much better than Golbguru, but way better than people in NYC and myself before. However, we’re looking for a reasonable upgrade in the next few months to have more space. Following our blog friend’s post on Shanghai volume , I want to share with you my family’s stories in China’s stock market. My mom has been in the market since I was in the secondary school. She lost half of her capital after more than 10 year’s investment. Up to two years ago, she was still struggling. However, since this year, every night when I talk to my mom, she will tell me how much more she could have earned if she had hold the stock longer, or had bought more. She put all our family savings into it now. And one of our relatives, an 80 year old lady, frugal for her whole life, put all her money in the stock market too. She does not know how to use computer or internet. So she keeps calling my mom to help her excute the trade. Just came about an article on hypermiling: wringing every last ounce of fuel efficiency out of a car. The story starts with Wayne Gerdes’ going 2,254 miles driving a Honda Insight on a single 13.7-gallon tank of gas. When I bought my SUV, $600 a year on gas is maximum. Right now, I’m looking at north of $3000 a year (longer commute as well). This is indeed a large chunk of ongoing expense. Time the stoplights on your commute route, and avoid red lights by adjusting your speed. To idle is to sin. If you’re going to be at a standstill for 10 seconds or more, cut off the engine. Follow the speed limit, or go at a slightly slower speed. The optimal speed seems to be ranging from 45 to 55 miles per hour. “Today’s cars can’t kick into their most efficient mode — called “closed-loop operation” — until the engine is sufficiently warm.” Invest in an engine-block heater or always go the longest segment of a multi-segments trip. Closed windows and no A/C are best. Try to keep gas consumption at a constant level instead of trying to maintain a constant speed, why you and not be honked by drivers after you. Inflate tires to their maximum allowable pressure and use synthetic engine oil. Using the tips, I got 28mpg out of a SUV rated at 24 mpg at an average speed of 65mph. How about you? If you want more hypermiling tips, visit GasSavers.org or Gerdes’ own Web site, CleanMPG.com. You were not age 701/2 by the end of the year. $110,000 ($114,000 for 2007) for single, head of household, or married filing separately and you did not live with your spouse at any time during the year. Besides the age restriction for traditional IRA and the income restriction for Roth IRA, a person need to have taxable compensation to contribute to an IRA. The taxable compensation includes salaries, tips, bonuses, commissions, self-employment income, alimony and separate maintenance, nontaxable combat pay but does not include passive income derived from property and investment (Table 1-1, Page 9). However, a non-working spouse (aka a housewife) can contribute to either IRA with the same maximums given the working spouse qualifies for the above criteria (Refer to spousal IRA in the above document). So the good news is that if Jacqui stay at home, both of us will be able to contribute to IRA though it’s not necessarily Roth. How to better measure home prices? As shown in the previous post, the median price is far from an ideal measure of home prices. In this softened housing market, a change in the types of houses sold may give people a deceiving picture of increasing prices. Here is an article titled The Follies of Measuring Home Prices from Rich Toscano.
. If only the rich are still buying the beachfront properties, we may see the median price increasing sharply in a declining housing market.
. The above two have been covered well in the Media, which may value tens of thousands of dollars but not included in the median price. One of the best solutions lies in the Case-Shiller Home Price Index (HPI), which measures market price changes based on repeat sales of individual homes. 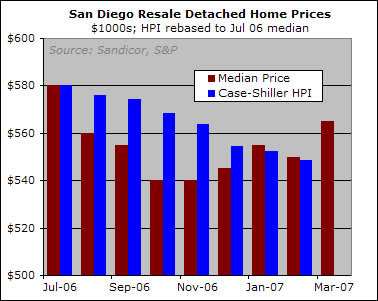 Here is a graph featuring a comparison between Median Price and Case-Shiller HPI on San Diego’s housing market. Looking at the Median Price (the red bars), you may think that San Diego’s Housing market hit the bottom b/w 09/2006 -11/2006 and rebounded back this year. However, CS HPI (the blue bars) shows a consistent decline throughout. Which one is correct? Correlating with sales volumn, we known the latter is the true picture. For more metro areas and longer periods, you can plot graphs on the http://macromarkets.com. To get individual home value and neighborhood demographics, I found http://www.cyberhomes.com/ very useful. This supports the analysis that this latest drop is worse for low-end markets suffered from the woes of sub-prime loans. A change in the mix of houses sold really skewed the median price data.